UPDATE: ForeFlight supports filing VFR flight plans between Canada and the US in either direction. VFR flight plans should be opened in the country of departure and closed in the destination country. For a Canada-to-US flight, close your flight plan by calling 1-800-WXBRIEF or through the Tower. For a US-to-Canada VFR flight, close your flight plan by calling 1-866-WXBRIEF. ForeFlight’s flight plan filing capabilities recently got a big boost with support for intra-Canada VFR flight plans. VFR flight plans for routes within Canada are now sent directly to Nav Canada, allowing customers to both plan and file Canadian VFR flights entirely within ForeFlight Mobile or via the ForeFlight website. ForeFlight also supports cross-border VFR flight plans from the U.S. to Canada and all IFR flight plans within or between the U.S. and Canada, in either direction. When filing a VFR flight plan within Canada, pilots are required to fill out the Destination Contact and Phone fields in the ICAO flight plan form. These fields specify who should be contacted if search and rescue actions need to be initiated. Pilots are also required to provide their license number, which can be entered after their name in the Pilot Name field (e.g. “Joe Pilot LIC 123456”). Pilots filing Canadian VFR flights are required to provide their license number, which can be entered after their name in the Pilot Name field as shown here. 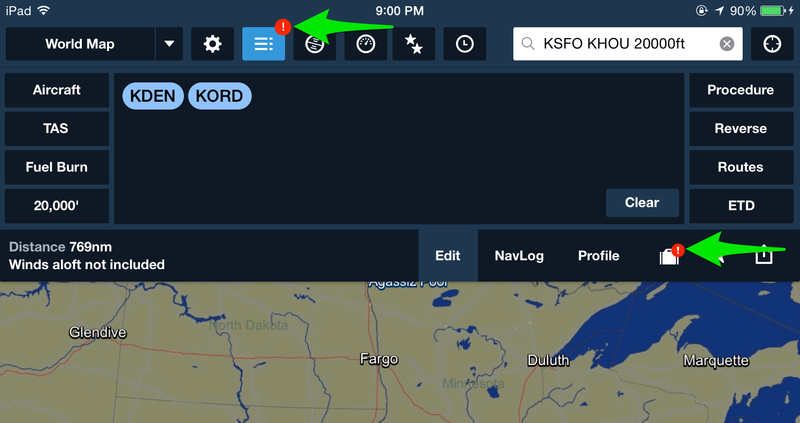 Learn more about filing in ForeFlight at foreflight.com/file. ForeFlight Pro Canada subscribers now have access to the full Canadian Department of National Defence (DND) aeronautical data. 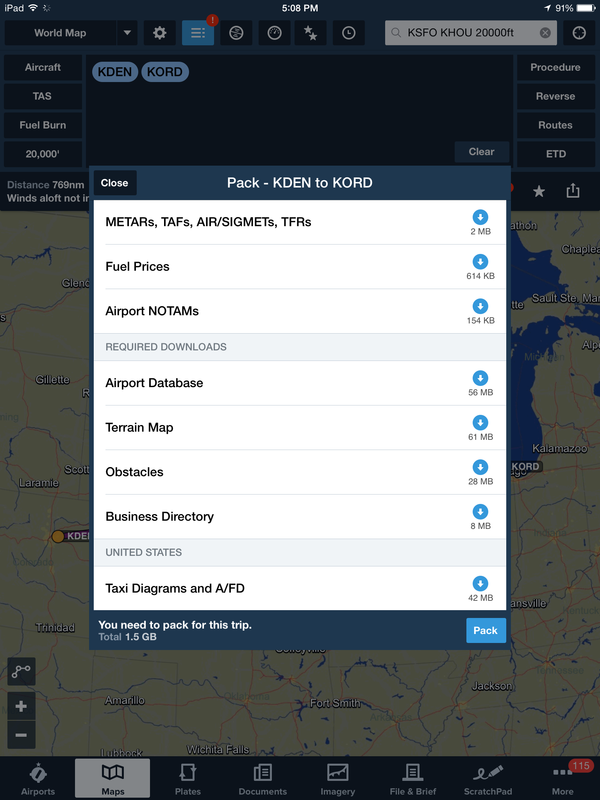 This includes 118 new DND aerodrome and heliport charts, departures, and procedures, all accessible in ForeFlight Mobile from the Plates view or from the Airports view under the Procedures tab. These charts are not currently geo-referenced, but will be made so in the near future. Canadian DND helicopter approach plate for Pembroke, ON. Additionally, there is a new DND section in the Nav Canada portion of the ForeFlight Mobile Documents catalog that includes the Canadian Forces Flight Supplement, the Government Publication Handbook (GPH) 204A: Flight Planning and Procedures Document, and the GPH 204B: Glossary for Pilots. The DND charts are automatically delivered via the normal 28-day update cycle and ForeFlight Pro Canada customers have access now with the October 15 update. 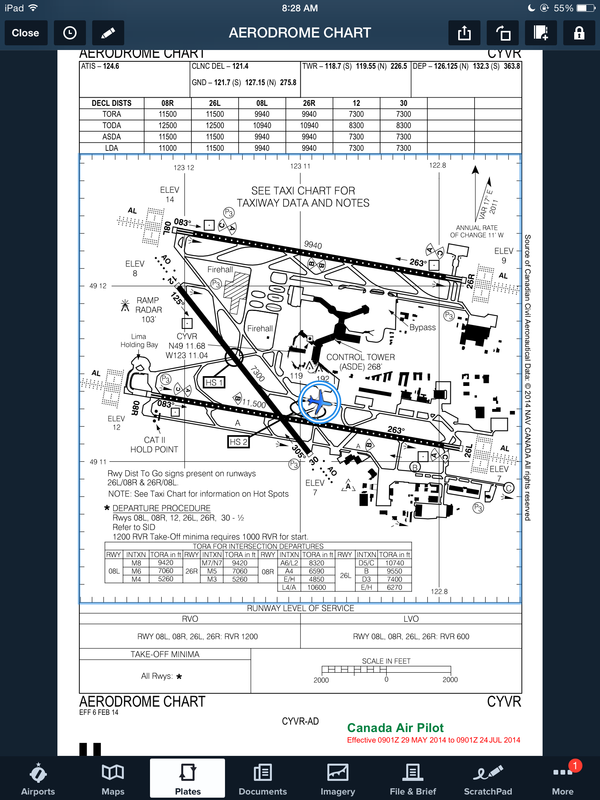 DND Documents in the ForeFlight Mobile catalog. On October 15, 2015 at 0901 UTC, the Medicine Hat VOR (YXH) in Canada will be decommissioned. This affects routes that include J477 past the US/Canadian border. Flight plans using this airway to fly into Canada will be rejected upon filing. To compensate, a new waypoint called OTVUK will be established October 15th on the US/Canada border where J477 previously crossed it. 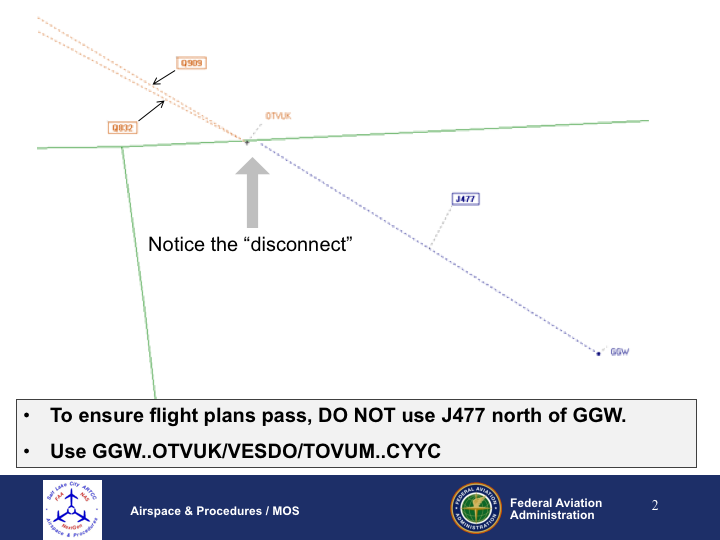 Pilots can file direct from GGW to this or other waypoints such as VESDO or TOVUM when flying into Canada. The NavCanada notice of this change can be found here. NAV CANADA has recently taken steps to modernize the Canada Air Pilot (CAP) and Restricted Canada Air Pilot (RCAP) publications. One of the six key areas of improvement is making all published procedures to scale, which (we are excited to announce) enables us to geo-reference them for ownship display. The new charts are available in-app now as a late-cycle 1406 data update. Current Canada subscribers will see the new, geo-referenced publications automatically replace the old ones as part of the standard data update process. Ownship display shown on Vancouver BC airport diagram. During pre-flight planning, brief your approach overlaid on the Maps view to better visualize the entry. Use annotations to trace your taxi clearance and follow your ownship progress across the airport diagram. Runway proximity advisor alert is also shown here. 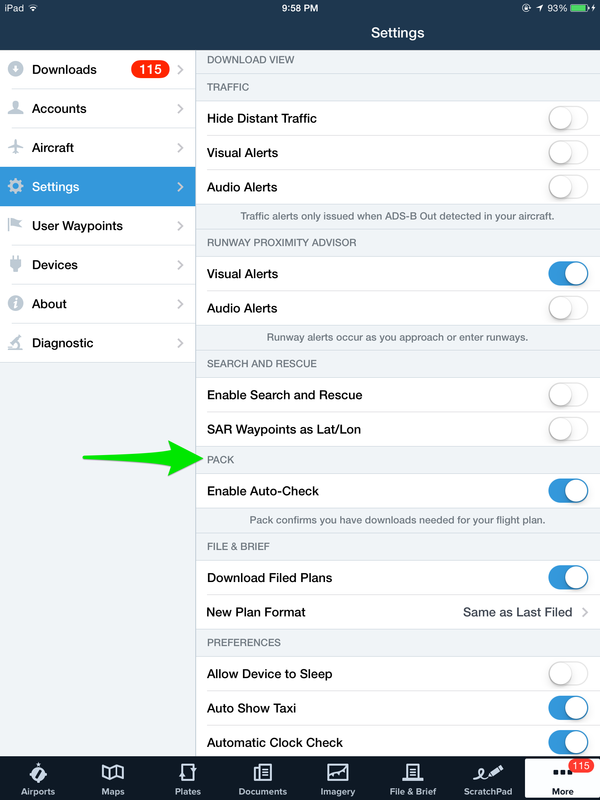 For greater situational awareness Inflight, use ForeFlight to cross-check your aircraft position overlaid on the procedure. ForeFlight Mobile Pro Canada is available for $149.99 per year. For more information and to purchase, visit our Canada web page. We’ve posted a video overview of the new Canada VNC/VTA and chart collar hide and show functionality. Enjoy! As a result of our expanded relationship with NAV CANADA, we are excited to announced the availability of digital Visual Navigation Charts (VNC) and Visual Terminal Area (VTA) charts in ForeFlight Mobile. The new Canada VNC map layer shows the entire mosaic of VNCs, with VTAs automatically appearing as you zoom into bigger metropolitan areas. These charts can be downloaded to your iPad or iPhone for offline use. The VNC and VTA charts are geo-referenced and optimized for display on the iPad and have a unique new feature: the ability to dynamically hide or show chart legends and change the stacking of charts to maximize clarity of chart features. The complete set of VNC, VTA, IFR enroute (low and high) charts, and Canadian Air Pilot (CAP) are included with the ForeFlight Canada subscription, $149.99 USD per year. Pilots can purchase or add Canadian coverage at http://www.foreflight.com/buy-canada. 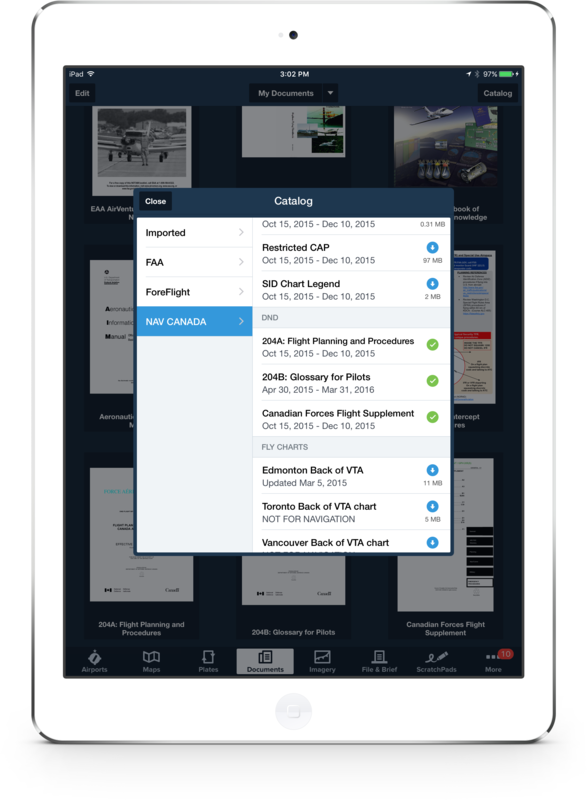 Pilots who already have an existing ForeFlight Canada subscription can immediately start downloading VNC charts upon upgrading to ForeFlight Mobile 5.2 – the new data is included in the existing Canada plan. The VNC and Helicopter map layers allow you to dynamically hide or show chart margins and change the stacking of charts. These capabilities are made possible by packaging the charts in the Flight Bag Tiles (“FBTiles”) database format, an open database specification invented by ForeFlight for packaging geo-referenced charts for use in mobile, desktop, and web applications. The FBTiles specification is free for app makers, website developers, and national Aeronautical Information Publishers (“AIPs”) to use in order to accelerate digital charting initiatives. The specification will appear on GitHub next week. Currently, Flight Bag Tiles are only available for the Canada VNC, U.S. Helicopter, Heli Gulf VFR, and Heli Gulf IFR map layers. To enable chart legends for these layers, tap the Map settings gear icon and set Chart Legends to ON. Simply single-tap on a chart to see its legend. Only one chart legend can be viewed at a time. Enabled in Settings, the new Distance Rings feature displays 3 concentric rings around your aircraft’s current location, allowing you to quickly get a sense of distance to features around you. Based on either time or distance values, the rings give quick estimates for time enroute or nautical miles to a nearby storm cell, traffic target, shoreline, or anything else shown on the Map. Green arrows on the rings animate smoothly to show your current track along the ground, providing yet another indication of where you’ll be in the future, and when. There’s even an automatic scale setting that keeps the rings in view as you zoom in and out on the Maps. From 2nm to 2000, the rings will provide a continuous reference from your aircraft. We completely revamped the Document Engine on the iPad to make it faster and more feature-filled. Tap on the new magnifying glass to display the search window then start typing. The search is extremely speedy, even in multi-hundred page documents like NOTAMs. When creating a new bookmark for a document, you can now give it a name to help you easily locate it later. You can also pinch-to-close documents for quickly accessing your binder. We also redesigned the FBO view to present more detailed information about facilities and amenities at your local airport. This is a free update for all existing ForeFlight Mobile subscribers. Click here for instructions on updating via App Store . This update also includes important bug fixes, and we recommend all customers update. Please read the latest Pilot’s Guide to ForeFlight Mobile, updated for this latest version, for important tips on flying safely with ForeFlight Mobile. For the cycle beginning October 20, ForeFlight Mobile now includes the Canadian RCAP (“Restricted Canada Air Pilot”) procedures. Enjoy! ForeFlight Expands IFR Coverage to Canada! We are thrilled to announce that ForeFlight has expanded to Canada! Over the past year, we worked alongside NAV CANADA to add IFR en-route charts and terminal procedures to ForeFlight Mobile for iPad, iPhone, and iPod touch. ForeFlight is the first app for Apple iOS products that provides sanctioned in-flight access to NAV CANADA charting products. Canadian charting is supported in version 4.1 of ForeFlight Mobile, which is available for download today from the iTunes App Store. The Canadian IFR charting products are available through a new ForeFlight Canada subscription plan. 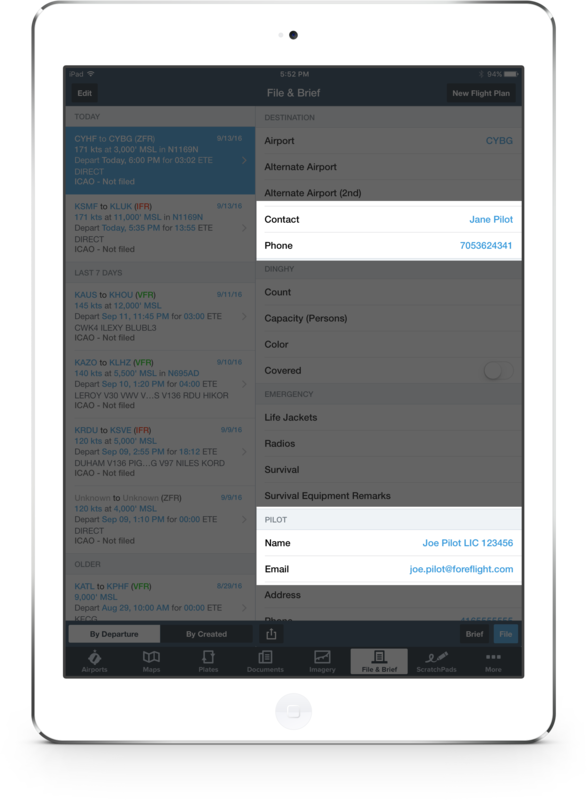 Pilots new to ForeFlight can purchase a subscription from within ForeFlight Mobile or directly from the ForeFlight website. Pilots who already subscribe to ForeFlight Mobile can make changes to their subscription and add the ForeFlight Canada option at http://www.foreflight.com/store/canada.php. 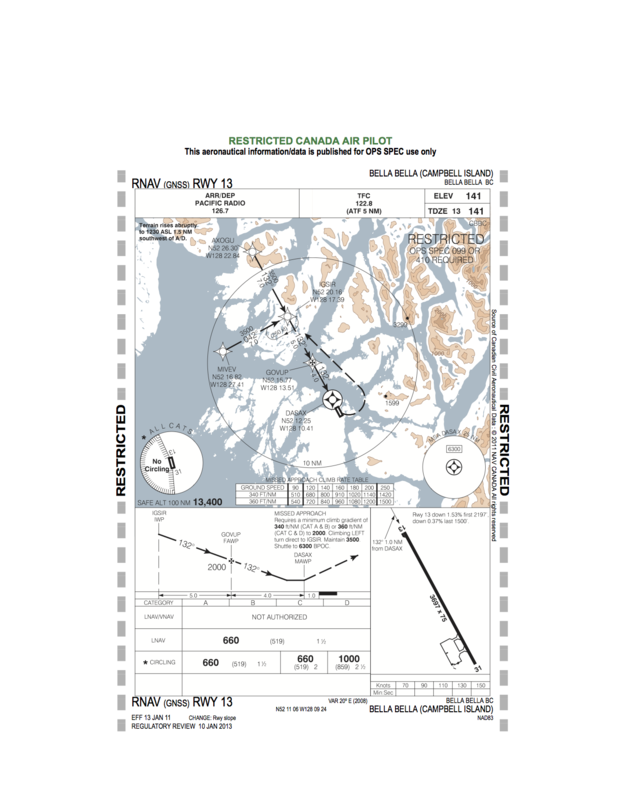 A big win over the past year in working with NAV CANADA is that the digital charts are authorized for use in IFR flights, subject to Part VI of the Canadian Aviation Regulations. Canadian operators who wish to use ForeFlight and its NAV CANADA charting products can obtain authorization by following the guidance materials contained in FAA Order 8900, OPSPEC/MSPEC/LOA A061, and FAA Advisory Circular 120-76A. The ForeFlight Canada subscription plan costs $149.99 per year, with special plans and pricing available for corporate flight departments and operators purchasing multiple subscriptions. ForeFlight is working with NAV CANADA on changes to its Visual Navigation Charts, as well as the Aviation Flight Supplement, so that those products can also make their way onto iPad, iPhone, and iPod touch devices. ForeFlight Mobile 4.1 is available in the App Store for download. We recommend all users update to the latest version.